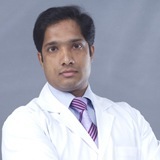 Dr. Leny Graduated in 2002 with MD-Physician degree from Irkutsk state medical university, Russia and completed his internship from MOSC medical college, Kolencherry, India. He did Post graduate diploma in Clinical Cardiology from Indira Gandhi University and successfully finished the course in 2008 december. Later Dr. Leny joined Muthoot Hospital, Pathanamthitta as a resident medical officer in Intensive care unit. He had worked in coronary care units of SGCVC hospital, Parumala and Frontier Life line hospital, Chennai as part of the cardiology training. Later joined LHH hospital, Kerala, and is with NMC group since 2013 as a General Practitioner. He attends to patients in the ER and OPD. He can speak English, Russian, Malayalam, Hindi, Tamil.